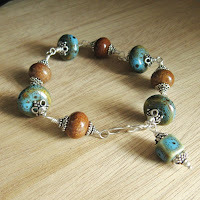 This bracelet has glazed ceramic and Tibetan agate beads on wrapped-loop links with sterling bead caps. It’s a simple technique, but the look varies widely with the type of beads you choose. 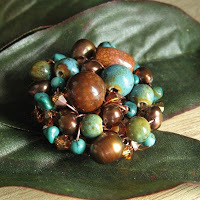 This pin is about 1.5″ across with glazed ceramic, Tibetan agate, freshwater pearls, turquoise, and Swarovski crystals. It looks similar to a mosaic pendant, but these beads are actually stitched onto a screen back so it is borderless and can be attached to fabric.